A couple years ago I started a revolutionary activity. I started running. I was inspired enough to ignore the fact that I don’t run, hate running and have never run and I, yep, you’re following along now, started slowly but surely to run. One of those warm spring evenings that I was out on a training run, it began to very suddenly pour. I was at least a mile and a half from home, with no hope of getting anywhere dry before I got soaking wet, so there was nothing to do but accept that I was going to get stuck in the rain and very very wet. So, I didn’t stop running. I soon found myself to be one of very few people on the street, and without even realizing that it was happening, I was jumping over puddles and… laughing. I was laughing! It was amazing. In fact, it was one of the most amazing feelings and amazing nights of my life. Sounds strange to say it, but yeah, it was incredible! There I was– me, a total non-runner– RUNNING, and I’m not sure if you knew this, but running makes you go way faster than walking. So, I’m RUNNING, and I’m soaked to the skin, slopping in my own shoes, have water running down my face and into my eyes and mouth and I’m jumping puddles like a kid and laughing out loud. I was energized and cooled off from the invigorating rain and could have cared less what I looked like, who was watching me or pretty much anything else at all. And I’d never felt so free in my entire life. It happened again a couple months ago, although this time wasn’t on a run. I was walking home from the train and it began raining almost as soon as I came up the stairs from the subway onto the street. I had no umbrella with me. So, again there was nothing to be done but accept that I was going to get wet and that was that. Once I accepted it, and that water wasn’t going to ruin anything– I got super soaked-to-the-skin-water-running-into-my-eyes wet. And ding ding, you win– Yes, I loved it. There comes a point, with something like this, where fighting, resisting, denying or hating isn’t going to change where you are or what’s going on. So, you give up the energy needed to resist and hate, and embrace where you are and damn, everything gets better from there. It started raining tonight just as I got off the train and began walking home. 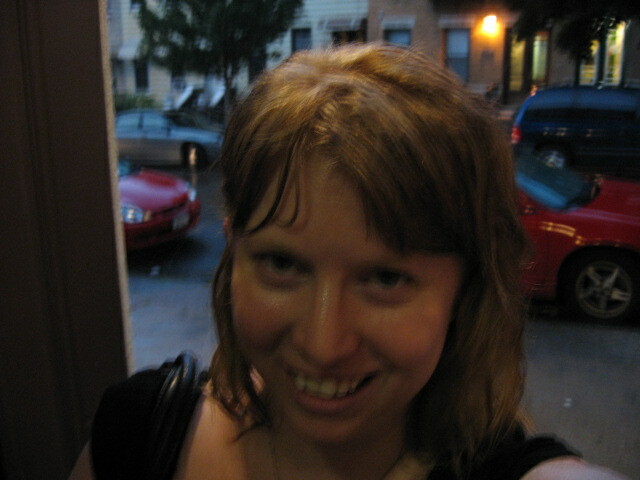 I got a little wet– enough to make it worth a spontaneous self-portrait for the day– but arrived home just before the rain got really bad. I was inside my apartment when I heard the sky open up and the rain pour down in sheets. And I have to admit– I was wishing the pouring had started 5 or 10 minutes earlier when I was still a ways away from home. I thought about going back out into it, but no, that wouldn’t be the same. You can’t fabricate freedom.